I have been wearing glasses and/or contacts since the early 1980’s. Almost every year I would head back to the doctor to get a new prescription for contacts and glasses. I would think about Lasik to correct my vision, but the thought of a laser coming at my eye (even for 30 seconds) would put me in a tail spin plus in debt. 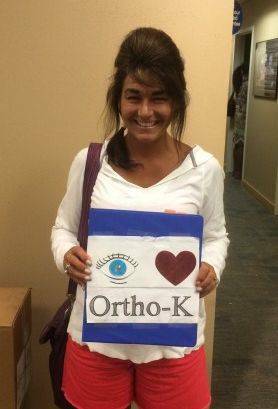 So imagine my surprise when Dr. Gellis told me this past June about Ortho-K, a non surgical way to correct my vision and eliminate my need for glasses or daytime contacts? Up to this point, I have bifocal glasses and use a mono-vision prescription for my contacts so I would not need readers. I used one eye for distance and one eye for close and my brain figured it out and it was going great. Dr. Gellis explained to me, in detail, how Ortho-K works by using a hard contact lens over night to change the curvature of my cornea, in turn correcting my vision during the day. "Tell me more." His explanation answered some of my questions, now let’s check price. Wow, it turned out to be 1/3 the price of Lasik. Where do I sign up? I was so excited, I could not wait to tell everyone that was willing to listen!!! Dr. Gellis fitted me for my custom made lenses, and by the way, I was one of the first to do this with him with mono-vision, and now within 2 weeks, my vision is 20/20. To not make this sound like a Cinderella story, there were a few bumps along the way. Keep in mind that with mono-vision, I am only working with one eye for distance vision and one eye for reading, so my night vision has needed some getting used to and I do find myself staring or concentrating a little harder when I get to the arms length distance of things, but that might not happen with everyone. The benefits definitely outweigh the bumps. I can now swim (and open my eyes under water) for the first time in 3 decades. I can rub my eyes and get splashed in the face without worrying that I might move or lose a contact. I can even fall asleep watching T.V. and wake up without that incredible dry eye feeling because my contacts felt glued to my eyes. That is only the tip of the iceberg. My whole perception of self has elevated and my self esteem and confidence has increased. It is amazing how “iSee” the world differently now with Ortho-k.